If you like pizza, I like you. You can go anywhere in the world, and you will never have a problem ordering it, because who doesn’t know pizza?!? If you don’t, then please contact me immediately so I can arrange you a date with pizza, or follow the recipe below, if you don’t fancy a date. My first attempt to make this pizza turned out into a disaster, self inflicted one as well. While carrying it out of the oven into my kitchen table (to take a snap of it, obviously!) it somehow landed on the floor, face down completely. While I was trying to think of every possible swearword in every possible language I know, pizza was creating a beautiful patterns on my kitchen floor and my lovely white wall. I’ve never been happier with having tiles on the kitchen floor! And I’m not going to lie, despite my pizza being totally ruined, I’ve simply refused to accept the fact that I will not eat any of it at that time…Nope, not at all. I’ve managed to eat a slice, but it was not photogenic at best (me or pizza that is!). So I’ve made it again the following day and the result was much better! Anyway, here is the recipe, and remember that just like with any recipe, you can change it, swap the ingredients to your favorite ones and make it yours! 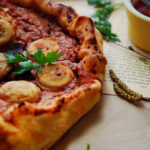 Pizza made with red bean paste, whole mushrooms and tomatoes. You can either, chop your mushrooms into slices or use the whole mushroom cups. If choosing slices, pan fry them slightly and mix them with your filling (without using blender). If using whole cup mushrooms, pan fry them first, on both sides. You will top your pizza up with them before baking it. Calories are an estimate per serving and one pizza can serve up to four people, depending on your appetite.